A domain that redirects to an MPB Today affiliate site provided by the MLM company implies that the firm offers "rebates" to prospects who join. This screen shot shows the page that loads if prospects visit the "rebates" domain. The "rebates" domain that causes this page to load does not explain how MPB Today prospects can secure a rebate after joining. Florida records show that the “cardholders'” firm — an LLC — was administratively dissolved by the state last month for failure to file an annual report.Â Other records show that the defunct company uses the address of a UPS store as its address. The U.S. Department of Agriculture (USDA) said last month that it was investigating claims made about the MPB Today program, which has been targeted at Food Stamp recipients. 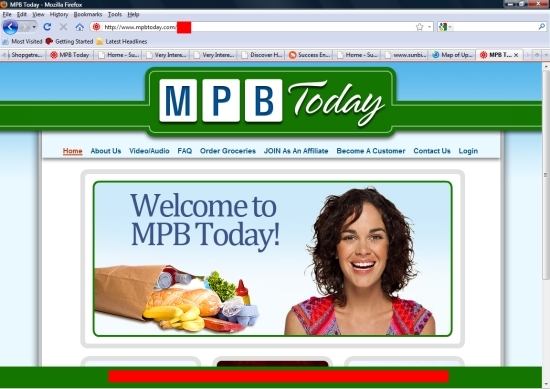 USDA had no immediate comment this morning on the domain that implies MPB Today offers rebates. Two words appear in this domain name prior to the word "rebates." If prospects click on the URL in Google search results, they are redirected to an MPB Today affiliate site. Both domains — the one that implies MPB Today offers rebates and redirects to the MPB Today-providedÂ affiliate’s page and the one associated with the “cardholders'” firm — are associated with the name of the MPB Today promoter. The domain that implies MPB Today offers rebates was registered on July 7, 2007, meaning it was in operation even before MPB Today and its purported parent company, Southeastern Delivery of Pensacola, were in operation. The domain that implies rebates are available and redirects to the MPB Today affiliate’s website does so immediately, and there appears to be no content that explains how one can get a rebate when joining the MPB Today MLM program, which operates a 2×2 matrix cycler. MPB Today does not promote a rebate program on its website. Why an affiliate would imply that it does is unclear. If any rebate transactions for MPB Today occurred as a result of the “Ken Russo” promo on ASA Monitor, they would have done so out of public view because private messages are not displayed to the forum’s readership at large. The ASA promo leads to a question about whether the forum was facilitating private MPB Today rebate transactions for “Ken Russo” during a period in which USDA was investigating claims about the firm. Meanwhile, the domain that implies MPB Today offers rebates and redirects to theMPB Today-provided affiliate’s site leads to a question about why affiliates apparently are seeking to lure prospects with cash payouts or the hint of cash payouts for joining the program. “Come on board and get your own checks and your own gift cards,” the woman said. Separately, we have identified six .org sites that actually are MPB Today affiliate sites. DNA and Narc That Car affiliates did the same thing. Also have seen another commercial for MPB Today recorded at at Walmart — this one was in the parking lot, and the other was inside the store. DNA/Narc pitchmen also filmed commercials at Walmarts. Spam comment posted in this thread from apparent MLMer with handle “Bill” deleted. Is it any wonder that MLM has such a miserable reputation?